When I was younger I lived in Scotland where I attended most of my school life. Although the countryside and scenary were awe-inspiring whilst growing up, there eventually became a point where there wasn’t very much to do. So I spent my time playing and learning the drums. I remember wanting to learn the drum kit in order to play in a band with my friends at school. At first my music teacher didn’t think I was able to play the drum kit but I was determined to prove him wrong and went home and practiced using a pair of drumsticks, my bed and some pillows. I then decided to get private drum lessons away from school along with my first drum kit. Before I knew it my music teacher at school was asking me to play at school concerts and events and moreover, my band and I were playing local venues in and around the area, receiving reviews in magazines such as **Removed By Admin** and appearing on compilation CD’s released by Independent record labels. After I passed my SQA Standard Grades (GCSEs) and SQA Higher Grades (A-Levels) in music I decided to further my skills more by attending Huddersfield Technical College and completing a BTEC in Popular Music. Moreover, once I completed the course I went on to further my skills completing a BA (Hons) in Popular Music at Sheffield University. 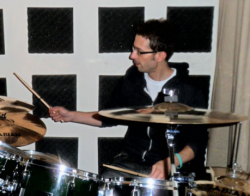 I had my first teaching experience when I was 16 years old at a music workshop during the summer holidays where I was involved in teaching groups of people how to play the drum kit within a band setting. At the end of the workshops each group that had formed had to perform their songs to the public. Since then I always had a desire to pursue my teaching and in 2006 I started teaching at Rhythm Inc Music Tuition in Barnsley. Initially, I only had a couple of students that I would teach in my spare time between my job and other commitments. However, more students started coming and having only started with a couple I soon had enough to become self-employed and put my all into my teaching. In 2007 I started teaching at Take 2 Music Academy in Birdwell, Barnsley and at Rockem Music in Rotherham. I have taught at other private music schools and in local schools in the Yorkshire area. I also have experience delivering group workshops within both private and local schools. Currently, in 2012 I opened my own teaching studio called**Removed By Admin** and continue to teach at **Removed By Admin**. I have recently completed a Post-Graduate Certificate in Education (PGCE) in Lifelong Learning at the University of Huddersfield. I am fully CRB checked and currently have a 100% pass rate for students sitting their graded exams. I have been teaching drum kit since October 2006 and became a full-time self-employed tutor in January 2008. I teach people of all age ranges in music centres across Yorkshire. **Removed By Admin** where I not only offer one to one tuition but also offer group workshops. I teach lessons from beginners to advanced level and incorporate the “Rockschool” and “Trinity Guildhall” Syllabus’ when and where appropriate. I teach all grades one to eight including sticking, time-keeping, theory, technique, sight reading, rhythmic exercises, improvisation and soloing. I have on occasions been asked to cover other drum teacher’s lessons if they are unable to attend. I have also visited many schools within the area and delivered workshops learning about the drum kit during after school hours as extra curriculum studies. I have graduated from the University of Huddersfield with a PGCE in Lifelong Learning and have QTLS status. I have experience of teaching with a further education setting and within a school environment. My approach to teaching drum kit is mainly one to one however I also teach paired learners as well as group workshops. I teach mainly using electronic and acoustic kits and like learners to get the opportunities to play both. I provide lessons that cater around the learners skills and abilities and moves at their pace. I teach all grades and like to teach learners how to play along to their favourite song/s. I feel learning should always be fun yet challenging at the same time.